At the O Bar they have it all going on, they have a great selection of champagne and cocktails, fantastic DJs in modern surroundings. You can also arrange a party here. Do you work at O Bar and Below? What did you think of O Bar and Below? O Bar rocks. Tend to head here late on a friday night and it is always buzzing. Love it when they drop some hip hop beats! Such an arrogant security i never saw in my life. Don't respect people at all...they definitely need to be kick off from the place...very stupid cheap place with lots of idiots especially at the door...the security who worked on Wednesday night 08.08.12 need to be smash into the face such a horrible and irrespectively attitude. He can speaks only with the girls this way unless he will be smash into the face. You can't even call him a man, because men don't speak this way with the girl. Don't recommend at all this place. DO NOT go here! Vile place!! Its full of immature boys and the bouncers are hopeless. I went there Easter Sunday only to be attacked by what can only be described as a child, who tipped MY champagne all over me before breaking my wrist. The worst part was the bouncers threw ME out and let the child carry on his night. They did not care at all what had happened, they were rude and sexist. It is over priced and the bouncers need sacking!! i wouldn't recommend my worst enemy to go to this hole! Any positive reviews you read about this place are written by the arrogant staff! The O Bar is the latest addition to Birmingham’s cocktail bar scene. It’s landed itself at the right location on Broad Street and is part of a very small group which comprises Opus in Manchester. It’s aiming to make a bang in Birmingham and certainly makes a statement with a bright colour scheme of lime greens and purples. The slate-faced bar is in front as you come in with a DJ booth tacked on the end. The banquettes have (you can only presume intentionally) clashing green grey and purple spots and striped patterns which only work in a consciously ironic 70s style way. You’ve got blinds on the windows and chandeliers hanging from the ceiling and a raised area at the very front with seating which actually looks out on to the street rather than towards the interior. There are a couple more rooms around the back and downstairs is the exclusive O Below bar which is small (30 capacity) but seems double the size due to the mirrored walls (careful you don’t walk straight into them at night). It’s equipped with built-in semi-circular glossy black vinyl booths and the flashing lights make this a club-like, upmarket disco bar. 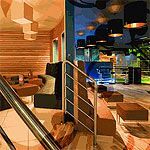 It’s early days but indications are that, after the initial shock, people are being seduced by The O Bar’s colourfully stylish ways. With two rooms, the upstairs bar and the O Below bar, there are usually two styles of music playing but it's generally an R'n'B and dance venue. Expect groups of lip-gloss girls with poker straight hair and guys in crisply ironed shirts. These two tribes, who seem to dominate Broad Street, spend the night flirting with each other over cocktails before stumbling outside and arguing with the bouncer or each other in the taxi queue. On draught there’s Kronenbourg, Guinness, Bulmers, Strongbow, San Miguel and Foster’s. And there’s Peroni, Tiger and Budweiser, Beck’s and Corona which is £2.50 in bottles. The cocktail list includes classics such as mojitos and cosmopolitans, alongside twists on classics such as orange caipirosca, Monte Carlo sling and Havana zombie (Havana rum, Myers Planter rum, sugar syrup, apricot brandy, lime, orange and pineapple juice) which is not too sweet but deceptively strong. They all cost £4.95 with shorter cocktails at £2.50 to £3. On the wine front there are five reds and five whites for £12 to £16 a bottle and bubbly ranges from Piper-Heidsieck Brut at £36 to a Dom Perignon Brut at £115. If you’re hungry, as well as salads and snacks, there’s a good selection of burgers — from beef and Thai chicken to veggie and bean — all for around £6 to £7. Once it’s settled in The O Bar will start attracting the custom it deserves. Meanwhile get yourself down to O Below before it gets too busy.